Is it real or is it digital? This image was created in Maya, Mental Ray, Paint Effects, Onyx and Zbrush by Alex Alvarez. It will be part of an upcoming instructional DVD from Gnomon Workshop. Impressive! You can still tell it's digital, but only because it has that slightly-too-crisp, very precise edges you also see in the super-realistic video games. I'd be interested to see something like this animated/in motion, to see if it still maintained the same illusion of reality. Looks good, seems to be lacking realistic color variation. Hi James, I just read this article about scientists that fed colored liquids to translucent ants. I thought it might interest you. black "Photo Shadow" generate this tedium. The eye is not looking imitated, it is the Photoaparat. amidst real nature? Karl Spitzweg would swear terribly! That's pretty wild. Last time I used Maya I made some backgrounds that looked like something from a Donkey Kong Nintendo64 game. It lacks a certain variety of greens. The dirt kinda gives it away. Too shiny. Still, this is very impressive. If this came up on a page of google image results for "forest" or appeared in a couple frames of a movie, I doubt anyone would pick up on it being totally digital. Whatever the artistic implications are, its certainly impressive as a piece of mimesis. Interesting. I wouldn't immediately peg it for a digital image. Looking at it, though, the fact that it is very difficult to differentiate shadows falling on surfaces from physical objects that are dark in color makes it less than appealing. The light is not as robust as the real thing, though I imagine top minds are working on the problem even now. Impressive, I agree with a lot of the above comments, but give them time. Before long we won't be able to distinguish virtual reality for reality! Just what we need, eh? Have you ever thought about digitally creating your models as opposed to clay? I wonder if it takes more or less time? Not being a 3D artist I am not terribly familiar with Maya, Zbrush or the like. Attempted to work in Zbrush once... it was at least fun, though I had no idea what I was doing. Perennial problem with CG renders (even from pros): get out and walk in the forest! You'd see considerably more contrast, way more colors and much greater complexity of shadows. What really bugs me though is this overall dreary underexposure. The result of a 3d render nowadays really depends on the artist who creates it. It has infinite possibilities. I am 3d artist myself and I can say you can achieve amazing results if you know what you are doing. One of the problems is that most of the 3d artists are more trainer on the technical side of things instead on the artistic one. These are all really perceptive observations. I was impressed with the naturalness of the foliage textures, but what caught my eye as needing work was how straight the cast shadows from the trees laid across the path. The trees aren's straight, nor is any forest path level, so they'd be much more uneven. Vlad, you said it. The 3D render can match a photo look, where the lack of color variation and black shadows might be what the artist was after. To match the way such a scene would look to a plein air painter observing with the eye, there would need to be much more variation in the green and more open darks. Then again the 3D render could be taken in all sorts of other artistic directions, such as the cool stuff the Blue Sky Studios people are doing with their WIP "Epic." Vlad, I've seen that 3D reconstruction of the battle scene. Any way to embed/share that video? Yes if a plein air painter has the necessary 3d skills the result will be a lot closer to a real painting. Didn't know about "Epic" Looks really promising. Hey guys, you may also be interested in this: http://www.cgarena.com/archives/interviews/rodSeffen/index2.html I think it goes with Vlad74's link about a 3D painting reconstruction. While he is not mimicking reality per se, he has a good eye for painterly kind of detail and color. Since digital techniques can be used to reproduce images of real things, I wouldn't know what my answer to the question "real or digital?" would mean. Could some of the textures used have been derived by clipping from photos of real objects? Is the scene more like a painting or more like a collage? Plant photos (textures) are used mostly for leaves and bark. Check cgtextures.com - this webpage is widely used by cg artists. Problem in CG art is that lots of people in this industry don't have any artistic skills at all. I think 80% of people working as CG artists have very little knowledge about art - they just are good craftsmen - "3d software operators" as I call them. Creating such 3d scene requires only time, work and craftsmanship - little of "art skill" is needed. That is main reason for lack of green colour variation in this picture. Computer really does everything for you - ambient occlusion, global illumination, shadows, translucency, light settings etc. CG artist don't need to thing a lot - it's enough if he will follow tutorials and use proper tools. 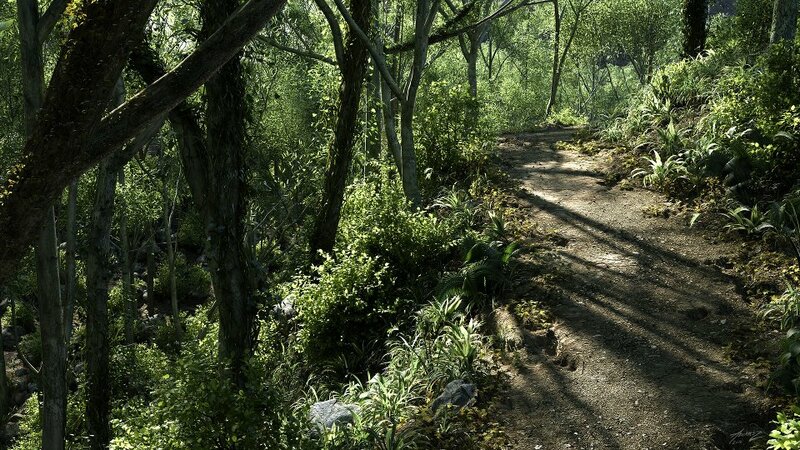 Crysis is reason why many CG artists make jungle environments. I made mod for game Mount&Blade some time ago - native game environments look ugly, game engine is really old, but still I managed to make something acceptable with really low resolution textures and simple models. I'm a illustrator who uses 3D and wholeheartedly agree that many people in my line of work are technical rather than creative. This means that we tend to get images like this scene, which is mimicry of a sort, but not born of observation. As such, the same mistakes get repeated year after year - epsecially in terms of the way light is handled. Sure, the software can mimic some of this but without a core of understanding and observation driving it along the end result is somewhat flat and sterile.